SE 200 Echelle Spectrograph UV-Vis-NIR (approximately 200-1100 nm) coverage in one exposure with high resolution. Interchangeable dispersion modules allow user to optimize performance for a particular CCD. Available alone (for use with user-supplied detector), or with CCD pre-installed. Contact Catalina Scientific for details. KestrelSpec ST-6 for Macintosh imaging spectroscopy software -- supported CCDs include SBIG ST-6I, ST-6V. 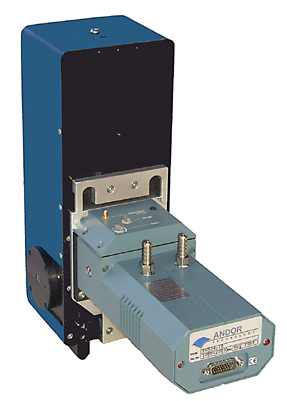 Optional spectrograph control, available for CVI DK240, DK480, or CM-110SP spectrographs, Chromex, and Acton Research Corp. SpectraPro series. Fully automates calibration of spectra in nm or cm-1 Raman shift. "One-button" autocalibration. Auto-step spectrograph between exposures. Contact us specific supported spectrograph models. Classic Mac or Classic Mode in OS X.
KestrelSpec for Windows imaging spectroscopy software -- supported CCDs include various Apogee models, Andor CCD/ICCD models, SBIG ST-6I, ST-6V, PixelVision. Optional spectrograph control, available for CVI DK240, DK480, or CM-110SP spectrographs, Chromex, and Acton Research Corp. SpectraPro series. Fully automates calibration of spectra in nm or cm-1 Raman shift. "One-button" autocalibration. Auto-step spectrograph between exposures.Contact us for specific supported spectrograph models. Kestrel OMA-III Macintosh spectroscopy software for use with EG&G OMA III diode-array systems. RS-232 (modem port) or National Instruments GPIB interface. Supports model 1461 and 1471 OMA controllers. Classic Mac or Classic Mode in OS X.
KestrelSpec ST-135 Macintosh imaging spectroscopy software controls Princeton Instruments ST-135 (GPIB interface) detectors. Classic Mac or Classic Mode in OS X. Contact us for details. KestrelSpec Photometrics Macintosh imaging spectroscopy software controls NuBus card interface version of Photometrics spectroscopy CCD detectors. Contact us for details. KestrelSpec ST-138, ST-130 Macintosh controls these Princeton Instruments detectors with NuBus card Macintosh interface. Contact us for details. Kate is going to use forex trader and hopes it is ok.